Whatever the task, you will find a CASE skid steer or compact track loader to meet the need. With best-in-class horsepower and bucket breakout force, CASE skid steer loaders will boost your performance and productivity. The widest cab in the industry provides a comfortable working environment with excellent visibility all round. The outstanding fuel efficiency and large fuel tank mean that all day running is possible without the need to refuel, further boosting your productivity. To deliver CASE specific performance and productivity to an ever wider range of customers, CASE Construction Equipment has expanded its skid steer and compact track loader line-up. The revised range includes six radial lift skid steers (SR models), three radial lift compact track loaders (TR models) three vertical lift skid steers (SV models) and one vertical lift compact track loader (TV model). The electronic engine control enhances precision and responsiveness to operator commands. All models with ROC higher than 1700 lb (SR175 and bigger) are equipped with High Pressure Common Rail (HPCR) technology, which regulates fuel pressure and injection timing ensuring extremely high injection precision in all engine operating conditions. This results in more torque output and allows to get more useful power from every drop of fuel. Cooled Exhaust Gas Recirculation (CEGR) process is now controlled electronically to achieve greater performance and fuel efficiency, as well as even greater reliability - for example, to help protect the engine from overheating. SCR- technology on all 90 hp models; a liquid-reductant agent (ammonia) is injected into the exhaust stream to reduce the level of NOx. For the customer, SCR means high performance, ease of maintenance and low operating costs. Diesel Oxidation Catalyst (DOC) utilizes a chemical process in order to break down pollutants from diesel engines in the exhaust stream, turning them into less harmful components. DOC is a maintenance-free component. Diesel Particulate Filter (DPF) physically traps particulate matter from the engine exhaust. Electronic controls will trigger an automatic regeneration of the DPF system. Additionally, the system can notify the machine operator to manually regenerate the DPF system occasionally when the soot load in the DPF exceeds the range defi ned for automatic regeneration. Our power stance chassis rides on a 21 percent longer wheelbase, delivering greater stability and comfort and allowing increased lifting capabilities, regardless of jobsite conditions. The cylinder geometry optimises the skid steer and compact track loader’s push and pull power, while the bucket support baring directly on the chassis of the machine further adds to its pushing power. Simply bolt on additional counterweights to the rear sides of the machine. Increase ROC by adding counterweights to move more material, more quickly Decrease ROC (operating without counterweights to keep fuel costs down and decrease ground disturbance. The large glazed surface with ultra-narrow wire side screens, the lowered threshold and thinner front pillars provide the best visibility in the market (ROPS / FOPS cab). Low thershold, together with convenient grab handles make accessing the cab easy and safe. The wide door, repositioned grab handles and a lower threshold provide easy access to the cab. All models have suspension seats and optional air suspension heated seats for the ultimate in comfort. If specifi ed with full cab glazing and door, the cab is completely sealed to reduce the amount of noise and dust. It’s not just the range that has expanded: all models benefi t from a cab with up to 25% more internal width, providing greatly improved operator comfort. Our cab - the widest in the industry - provides plenty of room for comfortable operation, with greater headroom and legroom, more space between the control levers and easy access to the seat. Comfort goes with productivity with CASE patented Ride Control. This optional feature is a shock absorber which reduces loader arm bouncing at elevated speed for greater material retention and increased operator comfort. More material moved, more quickly. The upgraded Case skids now offer EZ-EH (electrohydraulic) controls and software. Operators can quickly change between nine presets for speed and control customization. All controls are within easy reach and you can choose among mechanical hand drive levers or mechanical foot drive pedals, or electro-hydraulic controls. Standard Proportional control of Auxuliary Hydraulics with detent for smooth and precise attachment control. See how your favorite CASE Skid Steer Loaders compare. 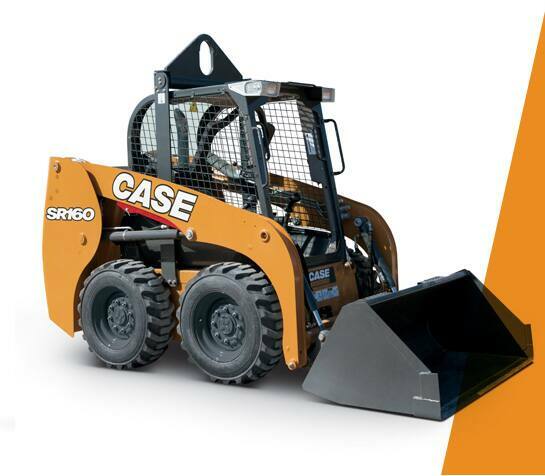 Configure your perfect CASE Skid Steer Loaders today. Download CASE Skid Steer Loaders brochure now!